Be honest, before this weekend had you ever heard of Y.E. Yang? I had, but only once. Back on March 7, 2009 when Yang won the Honda Classic tournament by one shot over John Rollins in Palm Beach Gardens, Fla. It was a meaningless win, unless you ask Yang — it was his first. Nonetheless, Yang remained an outsider until he reached the 72nd hole Sunday. All afternoon spectators and CBS announcers were left wondering when he would lose it, or when Tiger Woods would be the Tiger of old and blow by the little-known Yang. That never happened, however, as we all know now. Yang became the first Asian-born player to win a major tournament and the first player to knock off Woods after Eldrick owned a 54-hole lead in a major. Fourteen times before Woods had led after 54 holes and each one of those 14 times he took home the trophy. In fact, Woods has never trailed after 54 holes in any of his 14 major victories. So, it seemed a foregone conclusion he would take home the Wanamaker Trophy Sunday. Unfortunately for Woods, his playing partner had other ideas. Unlike those before him who had averaged four more shots per round when playing with Woods in the final pairing of the final round of a major, Yang stood tall Sunday. He outshot Woods time and again, finishing with a 2-under par 70 to Woods’ 75. Add a crazy eight for Padraig Harrington on the eighth hole Sunday and it adds up to an impressive 3-shot victory for the South Korea native. Yang’s win is significant for two reasons: he has proven Asian-born golfers can and will be a threat in any major tournament and he broke Woods’ streak of major wins as the frontrunner. Either one would make for a huge story, but both in one win? Incredible story. Yang did not just win a major either, he stood toe-to-toe with Woods and outplayed him in the final round of the PGA Championship. On the 72nd hole, when Woods, who sat one shot back, appeared to be in better position on his second shot, Yang hit the shot of his life. The 37-year-old was unfazed by Woods’ position across the fairway. Instead, he stepped up and crushed a hybrid 3-iron over a tree and bunker and within 12 feet of the cup, a shot reminiscent of one of Woods’ best shots of his career when he finished 2nd at Hazeltine in the 2002 PGA Championship. Woods, on the other hand, crumbled in the final round of a major for the first time. Instead of taking control of the tournament and fending off any challengers, he played an overly conservative game, which led to his 3-over par 75, when even par would have at least earned him a playoff against Yang. Instead of taking his sixth win of the year and avoiding a major-less season, Woods will have to wait until next year’s Masters to earn his 15th major championship and continue his march toward Jack Nicklaus’ 18th. And what makes Yang’s finish all the more impressive is his not-so-impressive start through 23 holes. After the fifth hole Friday, Yang sat at 5-over par, nine shots behind Woods at 4-under. Over the last 49 holes, however, the two went in completely different directions. Woods would finish 1-under over that stretch while Yang was an incredible 13-under par en route to a 3-shot victory. All this from a man who took up the game at the age of 19. After watching the video of Prince Fielder letting expletives fly in his attempt to confront Guillermo Mota following last night’s game, one question keeps running through my head. Has he lost his damn mind? 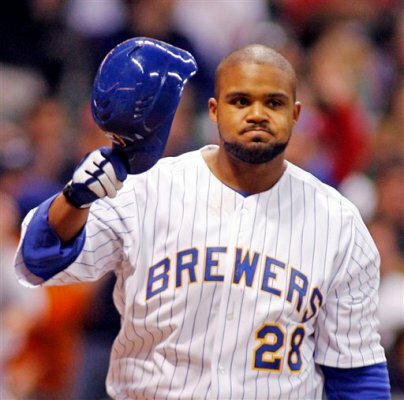 After Fielder was hit by a pitch in the ninth by Mota, he just stood at home plate and stared at him as he walked off the field. During the one time he had to show Mota just how upset he was about the pitch, he did nothing. As has been repeated many times today in discussing Fielder’s actions, there’s an unwritten rule in baseball about what to do in just such a situation. The “rule” dictates that Fielder should have gone to the mound and had it out with Mota right then and there, or be a man and walk to first base. What he should never have done is tried to force his way into the Dodgers’ clubhouse 15 minutes after the fact. Luckily for Fielder, his teammates and Dodgers’ security were there to keep him from Mota, who was no where to be found, or this incident could have escalated into a much larger fine and longer suspension than he will likely already receive. Obviously, there are more reasons to Fielder’s actions than just the plunking itself. Mota was — in case you forgot — a member of the Brewers last season, the game was far out of reach and the pitch was clearly not intended to be thrown anywhere near the plate. And let’s not forget how bad the Brewers have been lately and how much they look like they could be in last place by the end of the month. Even with all those things in mind, Fielder’s postgame actions were absolutely absurd. You would think someone whose father was a three-time All-Star and World Series champion would understand the do’s and don’ts of Major League Baseball. Unfortunately for him, he doesn’t, so now, we can all sit and wait to see how long Fielder will be suspended and how much he will have to pay. Instead of helping the Brewers find their way back into the NL Central Division race, Fielder will earn himself a spot on the bench for a few days in the near future.